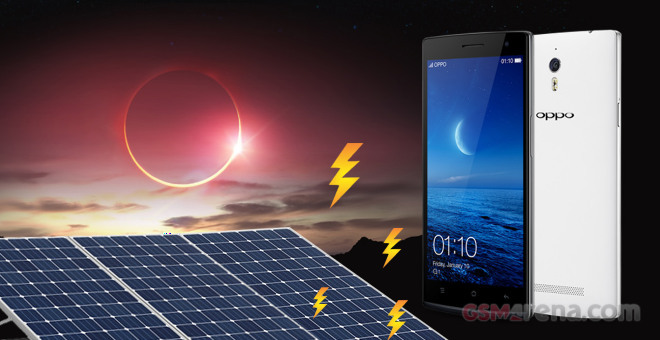 We’ve just finished our Oppo Find 7a in-depth review, where we’ve summarized our battery life impressions. Naturally it’s time to give you the breakdown of the results and compare it to other devices. The Oppo Find 7a has this rapid charging feature that allows you to charge 75% of the battery for just half an hour, while 5 minutes hooked up on the huge 4.5A charger will give you 2 hours of calls. That’s quite the promises and we’ve put those claims to testing first. The Find 7a battery indeed got 73% for about 30 minutes, but we needed another 30 minutes to get to 97% and another 10 minutes to get it charged completely. Still, those 73% were enough for more than a day usage. Also, 5 minutes on the charger will give you about 10-11% battery, which is indeed enough for making a 2-hour call if you don’t need anything else. Now that we’ve put Oppo’s promises to the test, it’s time we did our own routine. First we the battery performance under 3G network calls. The Find 7a battery went flat after 18 hours and 11 minutes, which is quite good result, though expected since the screen is off and the CPU is under minimal pressure. Next we’ve run our standardized web browsing test. With a display of such size and power-hungry top-notch hardware we didn’t expect any miracles. The Oppo’s battery was enough for 7 hours of web browsing, which isn’t exactly record breaking, but it’s not bad either. Finally, the Oppo Find 7a managed to last for 9 hours and 19 minutes of looped video playback – a solid score for a 5.5-incher. 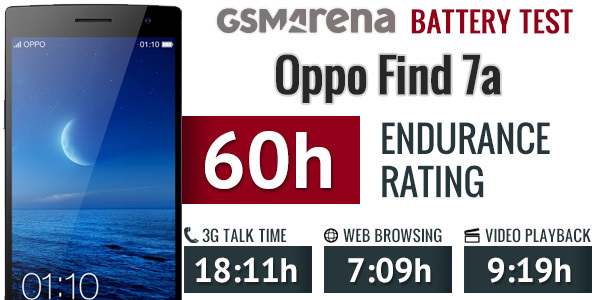 In the end the Oppo Find 7a pulled an overall rating of 60 hours. It did pretty well when it comes to talking, web browsing and video playback, but its standby performance is rather mediocre thus lowering the phone’s endurance score. If you’ve missed the Oppo Find 7a review, it’s live on our homepage and you can find it right here.